RoCAF RF-5E of the 12th TRS/401st TFW. Photo © Hsu Chun-Yuan. Please visit his Photostream for high-res images. Sad news from Taiwan. 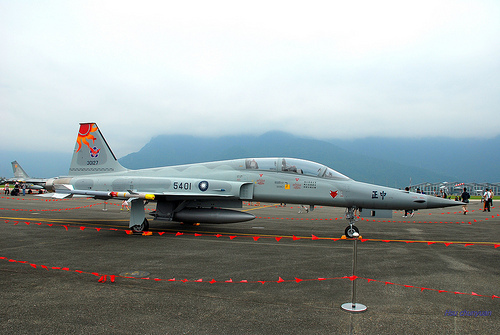 The Republic of China Air Force (RoCAF) has lost a RF-5E Tigereye photo-reconnaissance jet and a F-5F Tiger II fighter/trainer when both aircraft crashed into mountains in eastern Taiwan yesterday during a night training sortie. Reports this morning have indicated that all 3 pilots have been killed in the crash, which occurred near Su-Ao Township in Yilan County. In a statement, Taiwan's Ministry of National Defence said the two jets took off from their base at Hualien at 7:39pm local time yesterday evening, with radio contact being lost at 7:48pm and both aircraft disappearing from radar shortly after, at 7:52pm. The RF-5E pilot has been identified as Captain Hsiao Wen-ming, 29 while the F-5F was crewed by Lieutenant Colonel Chang Chien-kuo, 41 (pilot) and Major Wang Hong-Hsiang, 36 (co-pilot). The RF-5E was flying in the lead, with the F-5F the wingman. Fishermen from nearby coastal towns approximately 100km north of Hualien witnessed the aircraft flying along the Suhua Highway before hearing the crash and observing flames from nearby mountain peaks. The witnesses then notified authorities, which initiated a search of the reported area of the crash before locating the wreckage as well as the bodies of the pilots. RoCAF F-5F 5401/83-0127 of the 12th TRS/401st TFW. This is reportedly the F-5F which crashed last night. Photo © Hsu Chun-Yuan. Please visit his Photostream for high-res images. Taiwan's fleet of F-5E/F Tigers were locally produced under licence, with 308 aircraft being manufactured between 1974 and 1983. Seven F-5Es were converted into RF-5E Tigereyes by Singapore Technologies Aerospace in 1999-2000. The RF-5E lost is reported to be 5506 (83-0093/former RoCAF F-5E 5323) while the F-5F is reported to be 5401/83-0127. Taiwan's Tiger II fleet has suffered from a relatively high loss rate, with more than 30 airframes known to have been written off due to crashes and accidents. 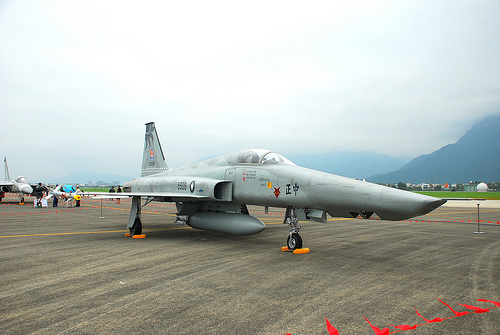 Hualien is home to the RoCAF's 401st Tactical Fighter Wing/12th Tactical Reconnaissance Squadron which reportedly only operates the RF-5, but as the above photo shows, it also holds at least one (but probably a handful of) two-seater(s), most likely for pilot training/conversion. Additional information courtesy of Don Chan, Taiwan Air Power and Scramble.